One of the top questions that brides-to-be ask when considering a Florida beach wedding is when is the best month to tie the knot? They want to plan the perfect day, but worry that a crowded beach or rainy afternoon could ruin their plans. There are several things that you have control over in your wedding, but the weather isn’t one of them. However, you can follow this guide to choose the best time of year to schedule your wedding. Florida is a top destination for visitors looking to escape the cold. Instead of frozen snow-scapes, we have white sandy beaches. Temperatures stay mild, typically hovering in the sixties during the coldest months. However, if you’re dreaming about a tropical Florida beach wedding with flip-flops and a cute strapless dress, you should be careful when choosing the winter months. Our beautiful climate is known for occasional cold snaps, where temperatures drop into the forties. Don’t worry though, within a few days, you will likely be relaxing by the beach when the weather warms up again. Spring is one of the most popular times to tie the knot. While the rest of the country is still trying to shake off winter, Spring is in full bloom in the Sunshine state. Flowers are budding, the weather is warm (but not hot), and the humidity is low. Many brides also build their destination weddings around Spring Break, so families are able to travel without taking the kids out of school. The popularity of Spring; however, can make the beaches and hotels more crowded. You will want to secure your space early before another bride scoops up your venue or your dream resort gets booked up. Temperatures peak in the Florida summer, but so does the chance of rain. The rainiest months are June through September, where parts of Florida can get up to nine inches per month. However, while it rains almost every day in the summer, the showers are often predictable. There will typically be a quick downpour for an hour or so in the afternoon and then the rain will clear out, leaving clear skies and beautiful sunsets. All of our venues have inclement weather plans. 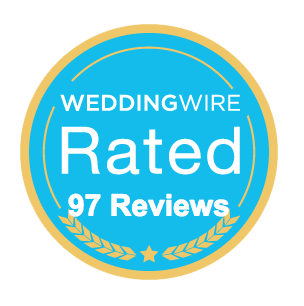 Check out our venues to find the one that is uniquely suited to your big day! Hurricane season also peaks during the late months of summer. While the risk of a storm is nominal, it is something that many brides take into consideration when planning their Florida beach wedding. From late October into December, Florida experiences its fall. Unlike the rest of the country, our fall doesn’t have crunchy leaves and cold mornings. Instead, the heat breaks and residents spend more time outside as humidity levels drop. Fall is another favorite time for a beach wedding because it is less crowded. There are fewer vacationers which means resorts are more available and affordable. There really is no bad time to get married in Florida. Our beaches and venues on Anna Maria Island look beautiful all year round, even when there is an afternoon shower. You’re sure to enjoy sticking your toes in the sand and enjoying our beautiful vistas as you exchange your vows.